Peninsula Village has paid a special Australia Day tribute to its volunteers for their invaluable contribution to helping residents. Four volunteers – Annette Kelly, Karen Batson, Deb Van Breugel and Christopher Bryden – were last week recognised for their exceptional efforts over the past year with special Australia Day awards. Peninsula Village CEO Shane Neaves made the presentation during an Australia Day achievement ceremony on Thursday 24 January. “The Australia Day Achievement medals and pins are an inspiring way to acknowledge the contributions and performance of dedicated team members. These awards offered us the opportunity to acknowledge the contribution of a number of our incredible volunteers for their outstanding performance in supporting our residents,” explained Peninsula Villages’ CEO Shane Neaves. “Words can’t describe how much we appreciate the sacrifices of all our volunteers, so we thought a unique gesture of visible commendation would better fit the bill. “If anything captures the essence of mateship, it’s giving up your own time to help others. “Australia always has and always will pride itself of extraordinary acts of mateship and the selfless deeds of Annette, Karen, Deb and Christopher have consistently amazed not only the residents, but also my team,” said Shane. 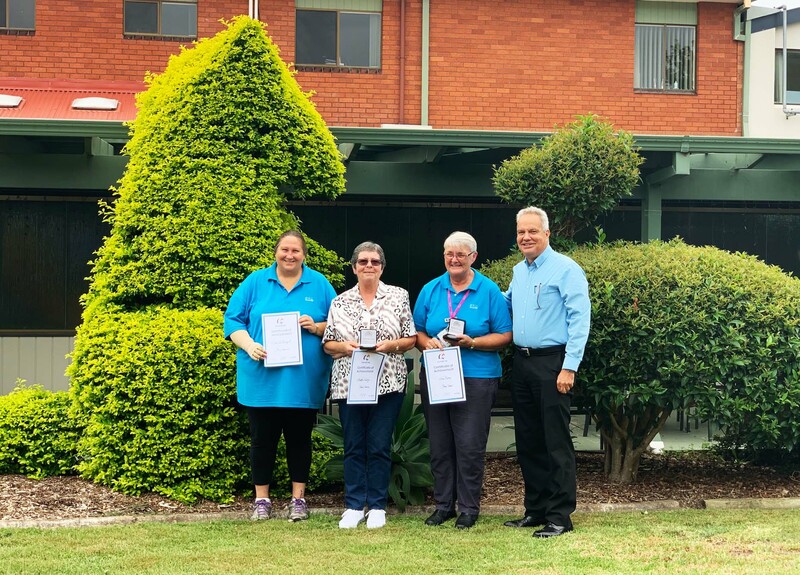 Annette and Karen, who often dedicate more than five days a week to their volunteer role were presented with engraved Australia Day silver medallions, while Christopher received an antique bronze lapel pin and Debbie a commemoration certificate. Each of these volunteers have gone the extra mile to make our older aged residents feel more at home. “As an independent living resident of Peninsula Villages’ myself, I really saw how beneficial and rewarding it would be to give back and help fellow residents who are not as mobile or active as me. My duties include everything from mail delivery to supported shopping, assisting with leisure and lifestyle activities and calling bingo and often I support the team up to six days a week. It’s a great way to keep active, stay social and give back,” explained Annette after the special ceremony. “Just like Annette I have been here volunteering with the Village for almost four years and I thoroughly enjoy the social aspect as much as the rewarding feeling of helping others. I have made some wonderful friendships and am so pleased to help residents maintain their independence,” added Karen. Deb Breugel is the volunteer bus driver who has held this role for almost 10 years. “I volunteer four days a week and am responsible for driving residents to special excursions, shopping trips and outings. I truly enjoy the opportunity to allow residents to get out into the community. If you have the time it is really rewarding to use it for giving back and supporting others,” said Deb. With regular and reliable volunteers declining in numbers, Peninsula Villages is hoping that the recognition of these incredible role models might encourage others to donate their time to support residents. “With the help of people like Annette, Karen, Deb and Chris, we are in good hands. But as a not-for-profit organisation, we can never have too many helping hands. “We’d love to hear from more people interested in helping their neighbours and experiencing the goodwill of making someone else’s life more enjoyable,” concluded Mr Neaves.